Info "Just reach out and grab it already!" S-T-R-E-T-C-H! is one of Kat and Ana's microgames in WarioWare: Smooth Moves. "The Remote Control" form must be used when playing this game. During gameplay, the player must control a certain animal and try to grab the object floating around them. If this is done correctly without running out of time, the player will win the microgame. 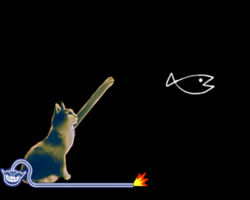 1st level difficulty: The player controls a cat trying to grab a stationary fish. 2nd level difficulty: The player controls an elephant, trying to grab an apple, moving across the screen, with its trunk. 3rd level difficulty: A monkey is controlled, and the player must try to make it grab the banana in the hands of a fast moving character. This page was last edited on February 19, 2018, at 18:20.